So you want to use custom domain name as your feedburner feed address. It's possible to setup custom domain on feedburner like feed.yourdomain.com. Just follow these steps to create one. 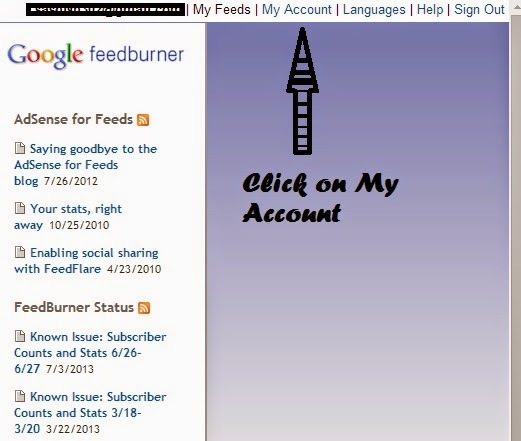 Feedburner is the best way to let your blog visitors subscribe to your blog feeds. Do you know? You can set the feedburner to automatically post post links to your twitter account. There are so many other features of which you're familiar if you're using it for your blog feed subscription. In this post I will tel you how to setup custom domain name to your feedburner feeds with MyBrands features of feedburner. Creating a Feedburner feed is very easy. Just go to this link and start burning your feeds right now. If you already have feedburner feed and you would like to add or attach a custom domain name to it than follow the following simple (not too simple) step. I use http://feeds.spicytweaks.com/HackersThiefs as my custom feedburner address. You can also setup a domain name like the one I have. You will just need to create a CNAME record with your domain name registrar or your hosting provider. Note: We will be creating custom domain for feedburner like feeds.yourdomain.com and if you would like a different name than feeds than use that name in every place where feeds have been used. Now go to the feedburner home page and than click on My Account located in the top right corner of the menu bar. You can see the image given below to know where is the My Account located. After clicking on My Account you will be on the Settings page from were you can set custom domain to your feed. Just click on the MyBrand from the left menu. It's time to add your feed specific domain name to the feedburner domain name field. Don't Worry, I will also tell you how to configure CNAME records. 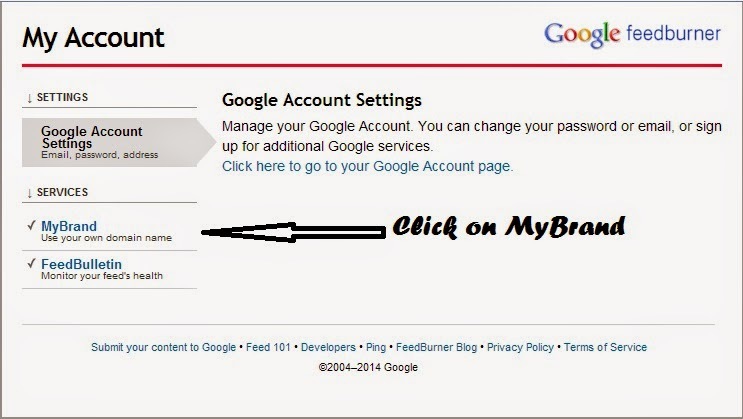 Add the feed specific domain name in the specified field and follow the following steps. You will see an image on the first step something like the one given below. Note: Yours will be different. Note down the CNAME entry which looks like the one given in the above image. Don't note down the entry from this image as every feed address have a unique entry and yours will be at the same place on the MyBrand page. 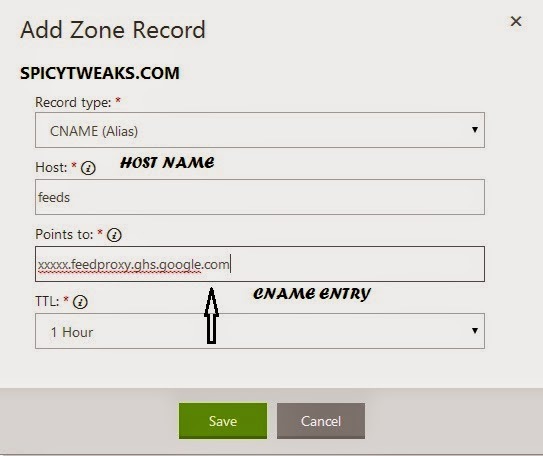 After noting down the CNAME entry follow the following steps to create a new CNAME record for your custom domain name like feeds.yourdomain.com. Don't close the Feedburner window now as we will need to activate the service after creating the CNAME records. If you have registered your domain name with GoDaddy than follow these steps. Sing in to your Account. Click on launch under the domain name. Now click on the domain name on which you want to create a custom feed address. 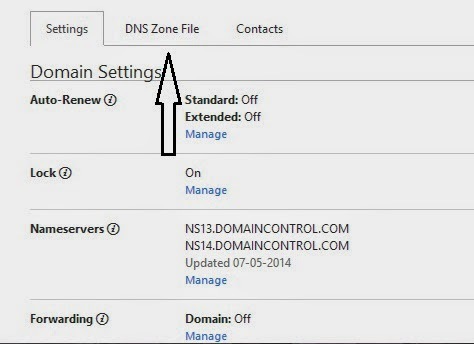 Now click on DNS Zone File. It's time to create a new record. Click on Add Record and after that a window will be show to choose a record type. Choose CNAME record. Write feeds in the host field like I have written in the above image. You can choose different word but its forma way for feed address. Now write the unique CNAME Entry in the points to field that you have got from the Feedburner. After adding the host name and the very important unique CNAME record at the points to field click on Save button. We have done creating the CNAME record. Now its time to go to the Feedburner tab. If you have chosen feeds as your host name than write feeds.yourdomain.com (replace your domain with your domain name) in the feed specific domain field. After that click on activate button located on the bottom of the page. 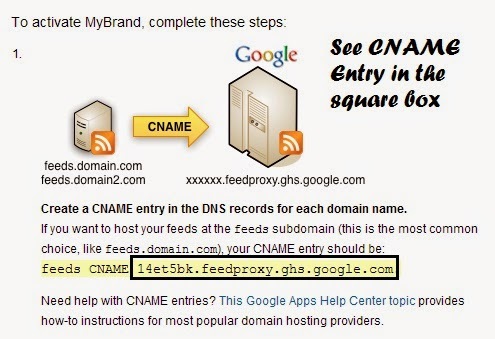 If you use a cPanel hosting than follow the following steps to create a CNAME record that points to Feedburner. Login to your sites cPanel and than click Simple DNS Zone Editor in the domain tab. After opening it, you will see something like Add a CNAME Record. Now enter the host which is feeds in the name area and it will auto complete it (in most cases). Now add the unique CNAME entry that you have got from the feedburner using the above step in the CNAME field and than click on save button. In your feedburner barnd page you will write feeds.yourdomain.com (replace yourdomain with your domain name). Now activate the feedburner service by clicking the activate button which is at the bottom of the page. That's All! I hope you're enjoying your custom domain on feedburner feed. If you need any help than ask me on comment. You will also like to read how to show only summary on feedburner feeds.